Nvidia UK has updated its online store with a range of GPU plus Kingston SSD bundle offers. If you scroll down to the 'hot offers' section it appears to signify an oversupply of GeForce GTX 1050 Ti and GTX 1060 cards, as the five on offer are all based around these GPUs. Depending upon your pick you can snag a free 120GB or 240GB SATA SSD. HEXUS has written a number of times about how the GPU mining craze resulted in Nvidia and its partners misreading future demand. A month ago a report from Taiwan suggested that a single OEM had returned 300,000 unwanted GPUs. Such an oversupply of expensive components has lead Nvidia to delay the introduction of the GTX11 series, according to many pundits. The latest 'leaks' from just a couple of days ago, point to the first GTX 11 cards, headed up by the GeForce GTX 1180, launching at Gamescom and becoming available from the end of August onwards. This will add further incentive for AIBs and retailers to reduce stocks of GTX10 GPUs as fast as possible over the coming weeks. Above you can see the offers available to UK folk. 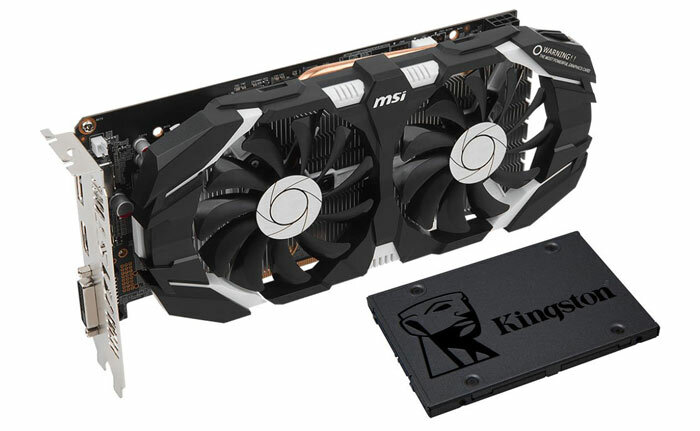 The two higher priced graphics cards (both GTX 1060 6GB models) from MSI and EVGA come with a 240GB Kingston SSD. The other three cards, a pair of GTX 1050 Ti cards and a GTX 1060, come with a 120GB Kingston SSD. Mainland Europe based Guru3D notes that the above promotional activity isn't confined to Nvidia UK. It says that the Kingston SSD bundles have been confirmed in some Nordic countries too. Yesterday we got an email from EVGA informing us about a new games bundle for buyers of EVGA GeForce GTX 1060 graphics cards and above. The promotional landing page just talks about North American bundle details and at the time of writing the EU promo link seems to be dead, but the EU store includes special offer thumbnail images so it should be updated shortly. 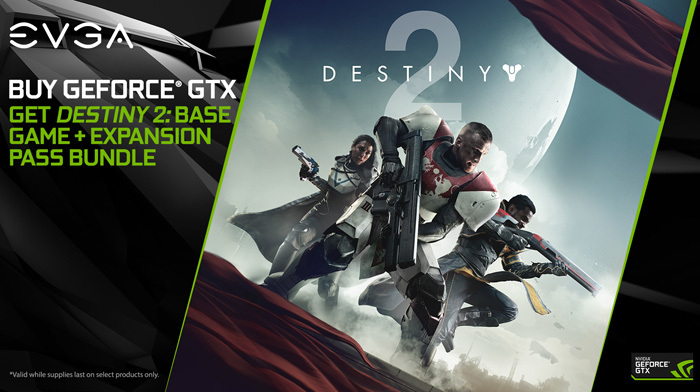 The deal is as follows: for a limited time and while supplies last, if you buy an EVGA GeForce GTX 1060 graphics card or above from a participating dealer, you can get the Destiny 2: Base Game + Expansion Pass Bundle for free. This bundle includes both Expansion I: Curse of Osiris & Expansion II: Warmind. 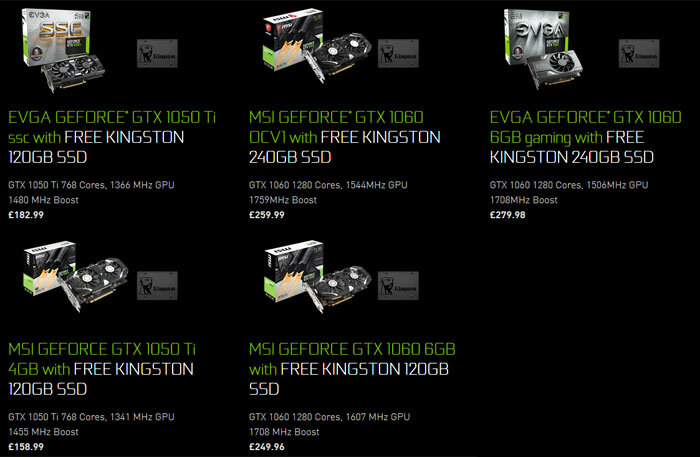 Nvidia's UK store forwards you to various online retailers, depending upon product choice. We will have to wait for the UK and EU offer pages to go live to see which retailers we can use to qualify for this offer. The EVGA free game code offer began on 23rd July. Nvidia once again overestimating the demand. As always this is going to end up jacking up next gen cards so they are able to move the stock they have of the current one out. Here's a crazy notion, nVidia, why don't you take the cost of those little bundled extras, and subtract them from the price, instead? Plus a bit extra. It's crazy to respond to demand drops with price drops, I know, way out there, but why not give it a shot? You might remember what it's like to ship products without triple digit margins. it's a residual value and future value thing. never drop the price, always add value to the product. Then a new product doesn't need to launch at a cheaper price. same for cars - don't discount them down, add extra equipment, warranty, 0% finance etc. I wouldn't be surprised if nvidia are looking to keep the GTX 10 series high in price, just so they can then launch the GTX 11/2000 series at even higher prices.